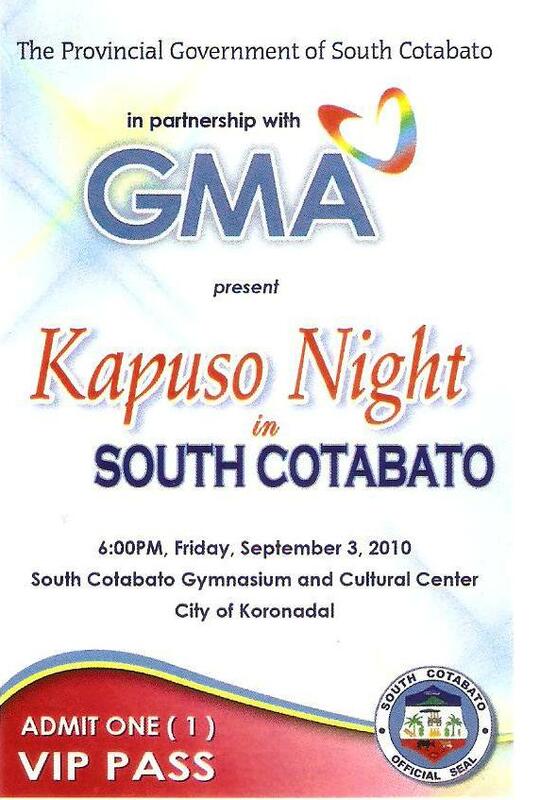 It is going to be one gigantic, colorful and unforgettable celebration for the people of South Cotabato as some of today’s biggest GMA stars and talents will come together to celebrate Kapuso Night in South Cotabato. VIP Pass?? leave a comment on this post. Limited only. According to reports, it would be the biggest and grandest one-night only show that will happen in South Cotabato's history, as GMA-7 reportedly will be sending almost 30 of it's most admired talents and stars including Janno Gibbs, Rochelle Pangilinan, Akihiro Sato, Survivor Philippines Celebrity castaways, Joshua Dionisio & Barbie Forteza, the La Diva (Jonalyn Viray, Aicelle Santos, Maricris Garcia), GMA- Davao Talents and other surprise artists! Don't miss this once in a lifetime Kapuso Night at the South Cotabato Gym and Cultural Center on September 3, 2010, show starts at 6pm. This FREE ADMISSION concert is being presented by the provincial government of South Cotabato headed by Governor Arthur "Dodo" Pingoy in partnership with GMA Network. Get your tickets now, FREE! at the ACTS-PPDO, Capitol Grounds, Koronadal City.